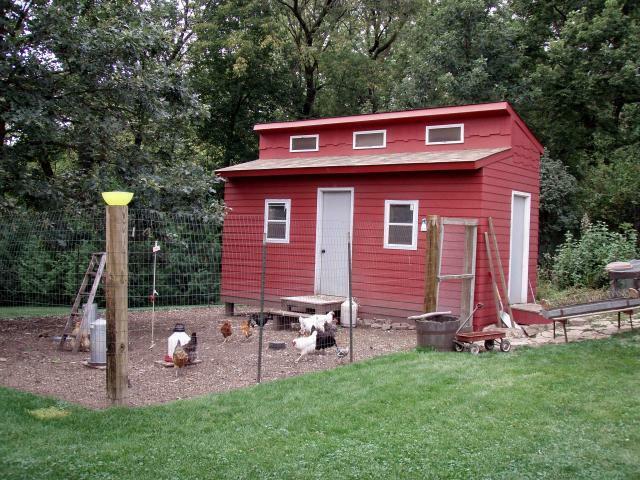 We saw a chicken coop on an abandoned farm site and my husband designed and built this coop based on that old coop. All of the framing was done with recycled lumber from our deck. The rest of the materials we purchased new at a lumber yard. The front of the coop is facing southeast so they get the morning sun. The windows on the roof line open for added ventalation in the summer and there are also two vents not visible on the rear roof. There is a chicken door with a ramp in the back of the coop. I have a flock of 20-25 hens we keep and we raise 100-200 meat birds every summer. These are all hatchery birds and we think they are beautiful and enjoy all of their individual personalities and the eggs that they provide. The coop was built in 2006, it is fully wired and insulated. We finished off the inside with pine car siding and a beadboard ceiling. I built my own 8 hole nest box and roosts out of scrap lumber. I am still improving the inside layout with the addition of dropping boards (this summer), a feed storage area and arrangement of the feeders which are hangiing feeders on individual pulleys. I have dibs on shutters from a friend and I may add window boxes if I can figure a way to keep the girls out of them. The chicken yard extends behind the coop. That area is about the same size as the area shown in the picture above. I have added a pair of Pekin ducks but we lost the female (a classroom project relocation) so we will be looking for a new hen. When we are home the chickens are allowed to free range. We get at least one if not two classroom/Tractor Supply drop offs a year. This year (2011) was the duck year and we recieved 5 mallards of varying ages of which only one made it to maturity and flew off this fall.